This is the corduroy suit I featured the fitting of last October - at the E. Marinella store in London. 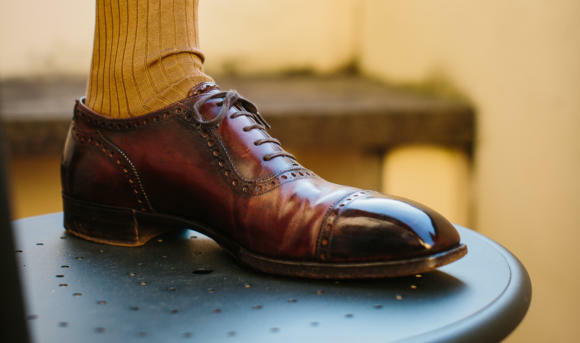 Although labelled as Marinella, it was made by Nunzio Pirozzi - a Neapolitan tailor with a wonderful moustache and a sterling reputation in Naples. I've yet to find someone that doesn't have a kind word to say about him. Like many tailors around the world, the trousers were also made by someone else, under Nunzio's direction - in this case, our friend Marco Cerrato. There were several issues with the suit, although the overall work and finishing was very good (again, something Pirozzi has a reputation for). The first issue was that the jacket was rather too tight - particularly for corduroy, which of course being cotton has no natural stretch. In fact, the images here are a good illustration of how hard it is to assess the fit of a jacket from photography. Although the line through the waist looks clean and flattering, it is actually too close to the body to remain comfortable for long when buttoned. Although I wore the suit to Pitti this past January, I ended up doing so with the jacket open most of the time. The trousers too had issues, though they were in the common Neapolitan vein of getting the hard things right, but missing the easy ones. The waist was a couple of inches too big and had to be corrected locally. The fork was also marginally too tight (though this has softened down with wear). We had two fittings in London, and perhaps with a third fitting (common for a first order) these things would have been corrected. The sleevehead was also more pronounced than I had anticipated. Despite being a spalla camicia construction, and very soft in the shoulder padding itself, there was a good deal of roping at the top of the sleevehead. This creates a stronger impression around the shoulder and, for me, makes the jacket too formal to work with casual trousers such as jeans or chinos. Again, this was largely a result of the two fittings, at neither of which were the shoulders finished to the point that the style could clearly be discerned. My fault perhaps to not question it further. Again, this can and will be corrected. Elsewhere the fit was very good - in the back, in the sleeve, in the line of the leg. There is (again) the common issue with Italian tailors that they cannot source the matte-horn buttons English tailors use, and which I generally prefer. But those too can be changed, and I may even grow to like these sportier versions. The waistband of the trousers is extended and broadened (to 5cm, the same as the turn-up) in the same style as my other Cerrato trousers. I wanted a corduroy suit because I love the idea of a casual, knockabout suit, and because I planned to wear jacket, trousers and suit separately (the 'three-way' suit, as I described it). In this outfit I enjoyed wearing very casual pieces with the casual suit: a pale-blue denim shirt and a grey cashmere tie - the Viola Milano collaboration with Alexander Kraft I reviewed here. Since receiving the suit, I've been told that Marinella in London are no longer going to work with Pirozzi, which is a shame as it makes this suit rather less relevant to UK readers. But given the style of shorter jacket, broader lapels, slim waist and narrow trouser, Pirozzi is a genuinely different and more contemporary option for anyone visiting Naples. Photography: Jamie Ferguson. Shot in Florence. You can follow the discussion on Corduroy suit from Sartoria Pirozzi, Naples by entering your email address in the box below. You will then receive an email every time a new comment is added. These will also contain a link to a page where you can stop the alerts, and remove all of your related data from the site. Very very beautiful suit and I particularly like the rollino of the shoulder. I was thinking of commissioning an olive corduroy sport coat but it’s true that having the trousers is worth it to be able to wear it different ways. I’m still looking for the perfect corduroy fabric though. I’d like it rather subtle. Yours is actually great. I like the colour and the cloth a lot. Shame that an easy thing to get right (waist) it’s not, even with one fitting this should be done right. Also not a fan of the rollino in a casual jacket. 1. 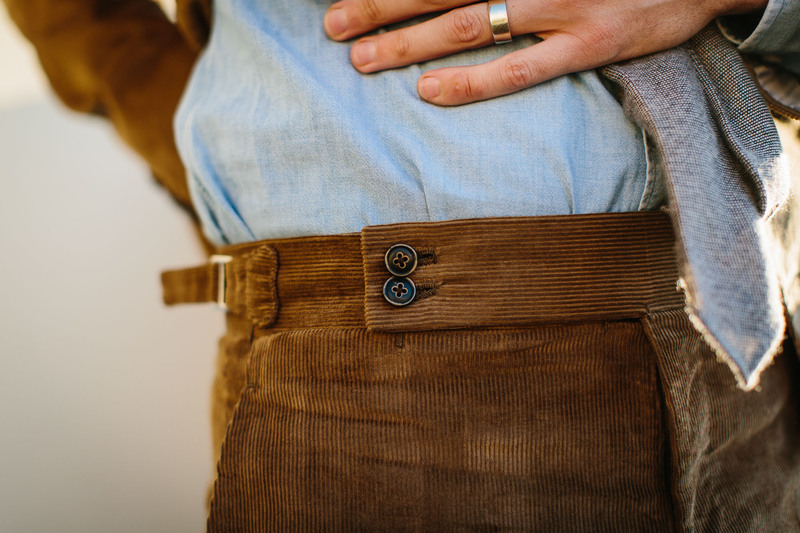 Do you find any advantage of having a broader waistband like this? I’m going to order my first trousers from Marco and I’m hesitating a lot about the design, if stick to the house style (which seems you did in your first two orders) or to opt for something rather unusual like single forward pleats but with standard waistband. 2. Where did you get those amazing mustard socks? I’m trying to source Bresciani’s in uncommon colours but it’s rather difficult. So I think technically this type of shoulder might have a different name than a spalla camicia even though it is as soft as a shirt shoulder. I think it might be a spalla insellata shoulder. In any case these shoulders look lovely. Especially on the first photo where your hands are not in your pockets. Apart from that my experience is that he offers one of the finest finishes in Naples. On my pieces everything is sewn very neatly and carefully. And I also got fantastic white horn buttons on my jacket. Yes, more polished than British horn buttons, but very beautiful. Thanks. The extra line of stitching is not required – the functional point is how the sleeve sits in relation to the shoulder material, and runs underneath it here in the same way as any normal spalla camicia. It is interesting how much focus is put on these construction points, though, when actually the sleevehead (its extension and build up of the sleevehead) arguably make more of a difference to the overall look. Simon, where is that shirt from, I’ve found it difficult to find that pale a denim? It’s actually a ready-made one (altered) from Al Bazar in Milan. The suit looks beautiful. What is the swatch number for the fabric and who is the manufacturer? Of course corduroy will stretch. I think you need to define the term. It will not stretch in both directions, in neither as much as wool, and it will not recover like wool. It was intended to be a lot more casual, and I think it will be when the sleevehead is changed. The A&S one has a lot more canvas in the chest and padding in the shoulder (even though not as much as other English tailors). Just as importantly, it has a structured, high collar which makes it very hard to wear with casual shirts (eg polos) or open-necked shirts. Hi simon. I just received 4 suits and 1 coat from Sartoria Sadano who Also comes to London. I was very expressed by very interesting Neapolitan style vision. Recommend he’s Sartoria a lot. P.s. According to you suggestion I also order and already receive shirts from d,avino and very happy with them. thanks a lot. Thank you, Simon. The comparison is not apparent from the photos and I agree the jacket will look so much different without the roping effect. On a different tack the tie is great, by the way. I don’t get much chance at all to wear them these days but a grey wool one will be definitely on the list. I think with the minor changes you are proposing to the sleeve head and waisting in the coat it will look really good. I’m not a fan of the waistband but that is just personal taste. Edwin makes a trouser without a waistband which gives you the lengthening you refer to but it looks wonderfully clean. I would say the same thing but after reading Simon’s post I looked at the pictures again and there is noticeable pulling around the buttoning point when the jacket is buttoned. I haven’t commissioned a bespoke garment but that seems like a major mistake after two fittings. Seems to be a fairly common theme that there are usually some issues with bespoke leading to some form of compromise along the way. My own experience, far more limited than yours, reflects this insofar as things have turned out to be not quite as I anticipated and after a few fittings I’ve ended up with something close but not exactly as I intended for one reason or another. The whole idea to me is that you should get what you want but there always seems to be some difficulty in achieving this in practice. Seems easy to miss something in the excitement of deciding how things should be and end up at crossed purposes with the tailor who may miss exactly what you are after or just have different ideas. In my case it’s usually that I want things to be less formal than the tailor thinks and I’ve ended up with a few pieces that aren’t as versatile as I’d like. Maybe I just need to concentrate more, be more forceful or take a checklist … however, my new grey flannels were cut too roomy and the waist 2″ too large despite my insistence on a slim cut and misgivings about the waist measurement, the alterations took 5 attempts to finally nail it. I did get the waistband adjusters I wanted though. 1, it varies hugely between tailors. No Savile Row tailor has ever made an obvious mistake on a piece for me. They are simply more professional. It may not be something you want to pay for, but you can. 2, I don’t think this has or will lead to compromise at all. Once the waist and shoulder are changed, it will be perfect. 3, I think the issue you are referring to is more the perennial one with bespoke, where it is very hard to design something from scratch. Which is why I always recommend seeing and trying examples of a tailor’s work before you have something made, and sticking to that style. Don’t try to change it into something else. The latter point is particularly true when you try to make something naturally formal into casual. It’s much easier to determine the fit of a bespoke trouser than it is a coat. You can, if you have decided what works, specify rise, outside and inside leg, waist, thigh, knee, hem, and get pretty close. Chest, neck and all that is harder. Well, I can’t speak to the Row, not having access to it myself, I wouldn’t say mistakes, more misunderstandings or lack of clarity and as you say with your corduroy suit, things can be rectified eventually. I think your point 3 is more where I’ve fallen down, not paying enough regard to house style and having a fixed idea of my own. I’ve read this often enough here but seem to manage to forget it each time I start a new project. This is a lovely suit! The entire outfit here is really chic! Presumably, the casual shirt and tie anyhow help to mitigate what could easily end up being a bit showy suit. I wonder whether this jacket, even if you get the sleeveheads altered to make them trully neapolitan, would work with jeans and chinos. Both your corduroy suits would end up never being worn as separate, I’m afraid. If indeed, you do have in mind getting the best from both. To be honest, I do not like corduroy suits, just a matter of taste. But yours definitely belong to the few I would love seing worn by friends! 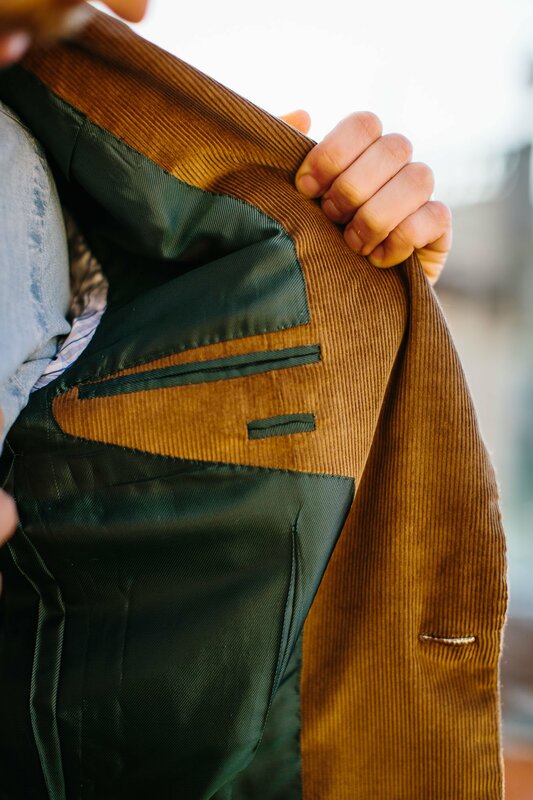 A quick suggestion: perhaps it would be a good idea to devote an entire post on linings: types of materials, suitabilily to fabrics of jackets and weather, etc. I love corduroy suits and have owned several since my college days in the 70’s due to their casual versatility. I wear them as separates 90% of the time. Unfortunately, I find most corduroy fabric options to be quite stiff. Cotton cashmere blend (my previous suit) was wonderfully soft but those fabrics have become terribly expensive. I found a LP corduroy with a cotton and 2 or 3% Elastine blend that gives a similar soft feel to cashmere blend and the added advantage of a bit of stretch for very comfortable movement. It felt comfortable from the very first wearing and I now most often choose this suit for long flights. When I saw this photo I thought wow but when I read about the fitt issues, I came away quite deflated. In general, are the Italians a bit fire, steady aim when compared to the best of the row ? I’ve tried to schedule a couple of appointments with Caliendo in London. This, in itself appears to be a little chaotic and doesn’t instil confidence. Back to the suit – fitt issues withstanding I think it looks quite good albeit I wouldn’t have picked the green lining. I do think that contrasting linings are quite garish. The shirt and tie, on the other hand, are excellent! Clearly Simon, you like this colour but it appears to be a bit close to your A&S. Weren’t you tempted with a change? A grey or blue would have been nice to see. With regards to your comments on the difficulties of wearing an open neck with Row bespoke. It would be great to broaden this debate. Doesn’t it depend on which Row house style we are talking about? Most of my suits from A&S are single breasted cord or linen and I think their drape cut is fine with an open neck providing you have the appropriate shirt. The PS polo is perfect and higher neck shirts also work. It is true that if you wear a regular formal shirt with A&S the weight of the suit collar will crush it – isn’t your point with A&S more to get the right shirt? With regard to other houses, I think the more military cut can be the issue. I’ve yet to see anybody wearing anything from Huntsman for example, that looks good without a tie. They inevitably finish up looking like an estate agent out for a drink. Conversely, I don’t understand your dismissal of C&M when it comes to louche or, as you call them ‘knock about’ suits. When I look at their site they have a divine visual that demonstrates their potential in this domain and certainly, the linen sported by Michael Brown last summer looked superb with his PS polo ! Who is it who is leading the charge at C&M when it comes to the more louche look? Is it Michael or Joe or both? I continue to be tempted by these guys. They do beautiful work. Good luck with the pop up – I will definitely swing by. Keep up the good work. 3) I find it difficult to wear open-necked shirts with any Row tailoring, although you’re right A&S SB is the easiest (DB is harder, as the opening is less). I have worked hard on lots of shirts variations too. Great response albeit the right shade of grey or blue cord is, in my book, is far from formal. When I look at the C&M website and the amazing standard of their work I’m becoming more and more convinced that the right choice of cloth together with dialing back some elements could make for some a great result. Do you think there are parallels between Cifoneli and C&M ? I ask because you had Cifoneli make that beautiful suede jacket and although I wouldn’t choose suede for that type of jacket, I think it looks quite spectacular and I do think it was a good example of a tailor who has quite a structured, formal, full on house style adapting to produce something different. Also, do you know how C&M and Cifoneli compare on price? Cifonelli is a bit more expensive, but not much. And their style is a lot less structured than C&M. Much lighter shoulder pad, much lighter chest canvas. And they can do a good soft Neapolitan-style shoulder line too. I love the beautiful balance your elegance has brought to the cheeky casual corduroy, Simon– but my question is primarily about colour, since I love this suit– especially against the light denim– almost as much as I adore your recent ‘Brown in Town’ donegal tweed, your tobacco linen, and so many other browns: do you adhere to the rules (emphasized by Flusser, for example) of choosing only colours that ‘match’ one’s own hair and complexion? I’m slightly ruddy, green eyes, mousey brown hair but also balding and greying– but I desperately love so many of these browns, even those lighter. Am I best sticking to the darker ones? I think it’s worth experimenting Jon. There is no doubt that skin colour and hair colour make a different to how clothes look, but in my experience you can mitigate all the things that Flusser and others talk about. You can wear this cord, but you might need more contrast (so white shirt, dark tie) or you might need less (as I have). There are a lot of things to play with. I’ve been reading for a while now and love the site. I’m due to finish school begin work at large law firm soon. I was wondering if you had recommendations in the greater NYC area for a first time bespoke experience. I will begin building a serious wardrobe per this site once I start work. Thanks again for all of the great content. This needs impressing on newbies to bespoke like myself very firmly. It took a while to dawn on me despite having read it many times here, but it’s a little like going to a Jaguar dealer and asking them to make you an Aston. Buy what they are selling. Taken in their most purist form, some House Styles have extreme limitations and are only interesting if they are capable of adjusting for lesser mortals. I am a fan of A&S but the suits they make for me are SB in either cord or linen and although the key element of their house style – their drape cut – is omnipresent the overall effect is well away from their normal stock in trade. I am often asked by some of the trendier Wendys up west where I get my suits. When I tell them, they are surprised. I originally went there because I was very impressed by some of the suits that they had made for Bryan Ferry and haven’t been disappointed thus far. The key thing is to have an honest, straight dialogue with your tailor and to be prepared to walk away if you aren’t fully convinced. Do you know who Marinella are working with now? Out of interest, have you ever had a more “formal” suit made up by a Neapolitan tailor? And if so, what did you think of it? 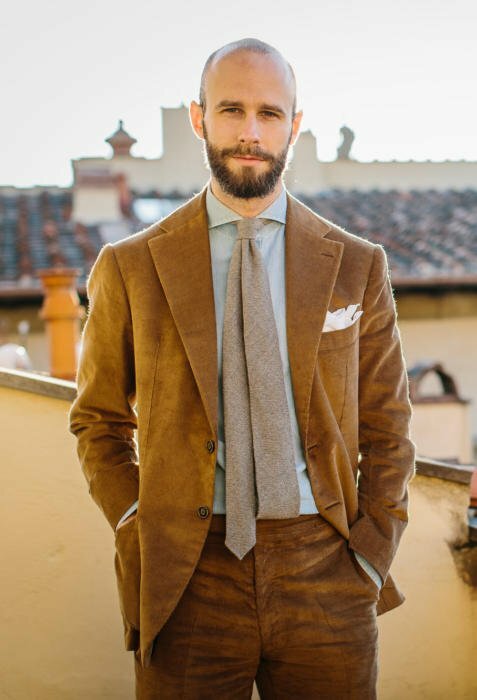 From the blog, i gather that you like the softer tailoring and reduced structure of the Italians for sports jackets, but is there any major reason (other than preference) not to use them for a work suit? I am interested in having a couple of flannel suits made up in grey and navy, and thought with the softer shoulder, they could be suitable for work and the weekend (theatre, opera etc). Hi George – actually a very timely question, as I will be writing about having a flannel suit at Panico this Wednesday. In general, no, there is no reason you can’t have a Neapolitan suit. The softness might look a little unusual, but only a little – the kind of thing only a sartorial enthusiast would spot! Ah, great. Looking forward to reading that then. suppose a forest green / dark olive corduroy 2pieces suit. I don’t have problem pairing trousers with other sport coat, but the jacket. Can be paired with flannel trousers too? Grey? And with sand whipcord? Yes on grey flannel. Probably no on whipcord. Avoid similar textures like that. Any cord on cord combo is a stylistic faux paus of gigantesque proportions and Simon gave a good answer. Flannel would be the only option but then, from left field comes the Cab. twill option. Surely a knockabout suit needs to be durable. How long do you think it will take before bald patches appear on the seat of a corduroy trouser? You’re right, and it would help if it was in a heavier, tougher cord. Heavy cord can be quite durable and has been used for such purposes traditionally. You mentioned in one of your comments that a heavier cord would be more durable, and presumably more resistant to “bald patches”. 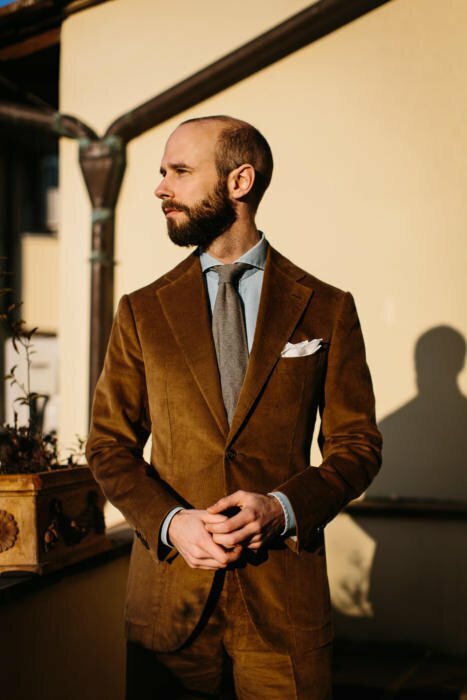 I’m looking to get a corduroy suit, and I wonder what weight should I aim for to reduce the possibility of bald patches (I don’t mind discolouration around the seems) Is 355gsm enough? or are you thinking of something quite heavy like 450gsm? Cheers. Ideally 450g, something like 7 or 8 wale? That would be a lot more durably, although also stiffer in the wear. I have to get a summer suit for a wedding, nothing too formal but I want something that I will be able to wear at seperates if possess I don’t wear suits for work. Is there a style or material you would recommend? Getting a smart suit that can then work as separates afterwards is very hard. To be honest I would recommend against it. 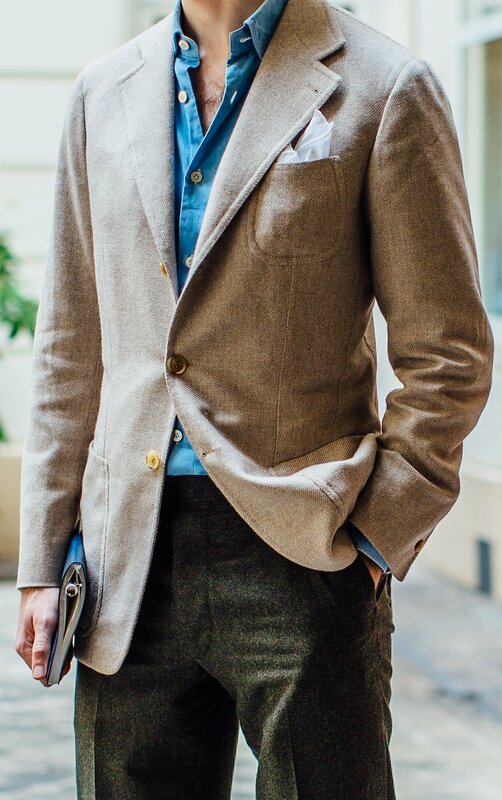 A navy hopsack might be nice, but ideally the jacket would have patch pockets and more contrast buttons to work better on its own, and navy trousers are great on their own either. Perhaps a tan linen with similar details on the jacket? I’ve always admired this suit very much. I recall that in the fitting post, you mentioned your hope that this would be a good 3-way suit, with the jacket and trousers both being versatile pieces in and of themselves. Have you found that to be true? What are the combinations of this suit as odd jacket and trousers that you find most beautiful? I dont know where to comment but i think this post is the most relevant. I am looking to get my first corduroy suit and I have narrowed it down to either navy or dark brown for the colour. This is where I am stuck. Which colour do you recommend and is the most versatile? I work in a fairly conservative office and both colours will work.